Happy Women’s History Month! Throughout the history of medicine, the health of women and children hasn’t always been prioritized. Safeguards might not have been in place to ensure drugs were safe during pregnancy, the right to abortion care has been under attack by both terrorists and lawmakers, and people haven’t had the tools they needed to prevent pregnancy. But throughout that same history, women have confronted these issues head on, creating a better world for everyone and keeping important conversations alive. Let’s meet some of these incredible historical figures now! 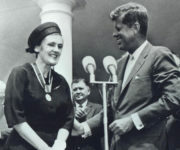 President Kennedy honors Dr. Frances Oldham Kelsey with the President’s Award for Distinguished Federal Civilian Service in 1962. In 1960, Dr. Frances Oldham Kelsey was evaluating drug applications for the FDA. When she received an application for a sleeping pill called Kevadon, she was unsettled by scant information on the drug’s safety and demanded additional data, triggering a game of tug-of-war between the pharmaceutical company and the FDA that persisted for more than a year. In November 1961, Dr. Kelsey was vindicated. Kevadon — aka thalidomide — was discovered to cause severe birth defects. According to the New York Times, children “were born without arms or legs, some with no limbs or with withered appendages protruding directly from the trunk. Some had no external ears or deformities of the eyes, the esophagus or intestinal tracts.” One estimate holds that 20,000 babies were born with deformities, while 80,000 died during pregnancy or shortly after birth. But, thanks to Dr. Kelsey, thalidomide was never approved in the United States. Frances Kelsey’s career might have been made possible by a misunderstanding. Her graduate advisor at the University of Chicago wasn’t a big booster of women in science, but he hired her after reading her name as Francis and assuming she was a man. Dr. Kelsey always wondered, “if my name had been Elizabeth or Mary Jane, whether I would have gotten that first big step up.” At the time, though, she wondered if she should even accept the offer to join the University of Chicago as a grad student. “When a woman took a job in those days, she was made to feel as if she was depriving a man of the ability to support his wife and child,” Dr. Kelsey told the New York Times in 2010. Fortunately for an untold number of wives and children — and everyone else — she decided to claim her rightful place at the university, leaving behind an incredible legacy. The Finkbines traveling back to Phoenix, en route from London. Sherri Finkbine was known to thousands of children as Miss Sherri on the local edition of the children’s show Romper Room. But Finkbine entered the spotlight for another reason in 1962, when she learned during her fifth pregnancy that she was at risk of having a child with severe birth defects. Finkbine was using sleeping pills that her husband had brought back from Europe, and the pills, she found out, contained thalidomide. Wishing to warn others about the drug, Finkbine shared her story with a reporter from the Arizona Republic. Today is the birthday of Emily Lyons, a nurse who was brutally injured when the clinic she worked at was bombed by an anti-abortion zealot named Eric Robert Rudolph. The homemade bomb was full of nails and shrapnel. Lyons lost one of her eyes and had multiple injuries all over her body. She had to have several surgeries, and was forced into early retirement. Lyons was the director of nursing at the New Woman All Women Clinic in Birmingham, Alabama. The bomb exploded at 7:30 a.m. on January 29, 1998, just as Lyons was opening the clinic for the day. Robert D. Sanderson, on off-duty police officer who was a part-time security guard at the New Woman All Women Clinic, died in the explosion. The clinic had previously been a target of anti-abortion protesters, and other women’s health care clinics in the U.S. had been bombed, but this bombing was the first time someone had died as a result. The New York Times interviewed people who lived near the clinic to find out how they felt. To hide in fear, to be silent, to be consumed by anger and hate, or to not enjoy my life, would be a victory for my attacker. It is a victory I chose not to give him. Every time I smile is a reminder that he failed, and I enjoy constant reminders. After earning her nursing degree from the University of Alabama in 1977, Emily Lyons developed a suite of skills in a variety of health care settings, from in-home care to emergency services. She passed on much of her knowledge to future nurses when she taught at the University of Arkansas at Monticello, and by 1998, she had taken the helm as director of nursing at the New Woman All Women Health Care clinic in Birmingham, Alabama. The 1990s were a time of numerous murders and attempted murders of reproductive health-care providers. Lyons remembers little from January 29 of that year, a date 15 years ago today. She woke up earlier than she wanted but pushed herself through her morning routine, knowing she could look forward to a nap after work. She also looked forward to being home again with her husband, who was back from two weeks of business travel. But when she arrived at work, a devastating act of violence would ensure that nothing that ordinary would happen to her that day. At 7:33 a.m., just as the clinic was opening, a bomb containing dynamite and nails exploded outside, killing security guard Robert Sanderson and critically injuring Emily Lyons. Although it was one of dozens of abortion clinic bombings that had occurred since abortion was legalized in 1973, the bombing of that Birmingham clinic was the first that resulted in a fatality. The five prior murders of reproductive health-care providers had been by gunshot.